I was introduced to North-Indian curries during my primary schooling! Dad planned to take us to ‘Nootan Restaurant’ one evening… We were so much excited to dine something different :) And the first curry we ordered was ‘Kadai Paneer’… At that time, there were very few curries in menu, n specially 2-3 only with Paneer like Paneer Butter Masala, Paneer Tikki Masala… But this name fascinated me to order with butter naan! 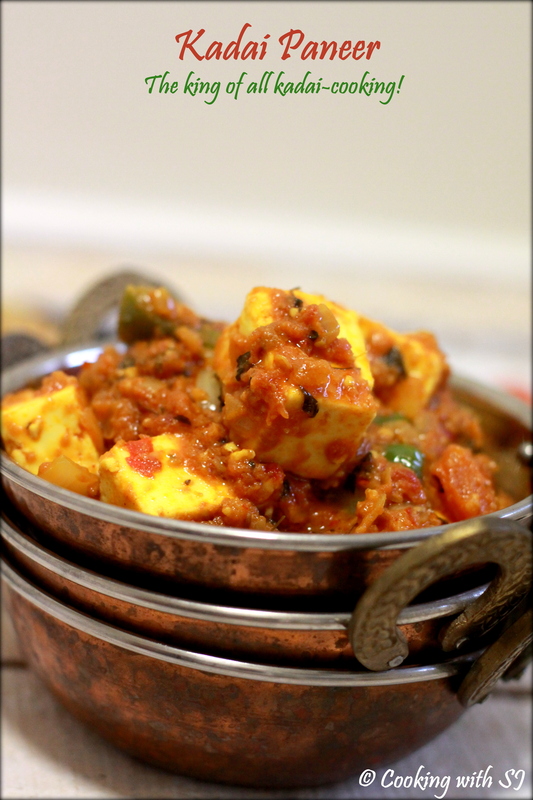 Quick (hardly 10-15 mins), simple (easy-to-follow) and delicious (spicy one) curry – “KADAI PANEER“!!! Dry roast red chillies and coriander seeds in a pan and cool them down a little. Heat oil in a kadai and add ginger garlic paste in it. Saute for a while and add chopped onions, capsicum and cook until onions are translucent. Add tomato puree along with chopped tomatoes along with salt and turmeric powder and cook it for 2-3 mins to release raw aroma of tomatoes. Mix all the spices and add paneer cubes too. Coat them well with gravy. Cook on high flame for about 1-2 mins and turn off the heat. Transfer it to a serving kadai and squeeze lemon slice. Serve hot with Butter Naan or Paratha! You can skip using onion-garlic to make a Jain version! Where was that restaurant? Dish looks yum. Hello there! I could have sworn I�ve been to this blog before but after going through a few of the articles I realized it�s new to me. Nonetheless, I�m certainly pleased I came across it and I�ll be book-marking it and checking back often!